I am still working on my Farmer's Wife Blocks, though to stay on schedule I need to make 5 more blocks by the end of the month (may not happen). It has been very gloomy here. I know that I shouldn't complain about the weather since it is perfect in San Diego almost all of the time, but when it rains all I want to do is stay in bed and read. This has not been a productive week. All of these came from scraps except for the pigs and the strawberries. It has been a fun challenge to dig through my scrap bins and use up some tiny pieces. Also, I wanted to mention that I guest posted over at The Sassy Quilter about making Triangle Quilts. 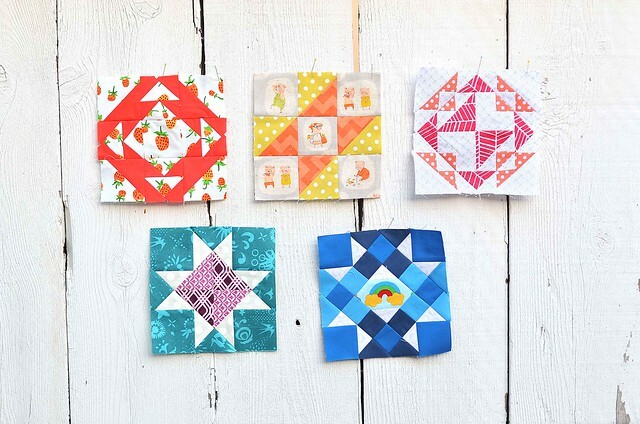 She is hosting a Triangle Quilt Along and is going to be including lots of tips and tricks about sewing triangles. If you want to trade, I'll take the rain any day! You can come up here (Canada) and have some of our snow. Love these blocks, especially the little fussy cut pigs. TOO cute! I you lived here then you'd never want to get out of bed!! i love the blue rainbow block. it's gorgeous! These are great Erica! So perfect and whimsical. It's been a while since I've worked on mine, I've just been too busy with other projects! this are so cute! Love the piggies and that top right one. And by the way, your blocks look great, so colourful! Loving your farmers wife blocks! I think the bottom left is my favorite. I really love that teal! Pretty bright blocks. I feel the same in grey weather. I can't complain either because the weather in South Australia is very similar to Southern California!